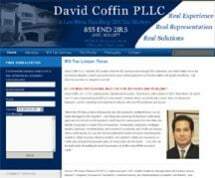 David Coffin PLLC is a Dallas metro area law firm focusing in the area of complex tax resolution law. Business owners, professionals and other attorneys throughout the Dallas Metroplex turn to attorney David Coffin for help when facing serious IRS payroll tax issues including the personal assessments of the Trust Fund Recovery Penalty (TFRP). Payroll tax liabilities are treated differently than income tax liabilities. Business owners who fall behind in collecting payroll taxes may be assessed a significant TFRP. The TFRP is not dischargeable in bankruptcy and the IRS has ten years to collect this debt. Avoiding the TFRP requires extensive experience and in-depth understanding of IRS rule, regulations and processes. "Once a business falls behind on collecting payroll taxes, it is very difficult to catch up with the IRS. If you have received a letter or an agent has visited your office regarding payroll taxes, you are probably facing a TFRP Assessment. These cases are difficult and require an in-depth understanding of strategies for seeking a resolution that is acceptable to the IRS, as well as the business owner." Tax Lawyer David Coffin. Mr. Coffin focuses on cases involving payroll tax liabilities in excess of $100,000. Prior to founding David Coffin PLLC, Mr. Coffin served for 11 years as a trial attorney for the Department of Justice, Tax Division, representing the Internal Revenue Service (IRS) in federal district court where he litigated many TFRP cases. From offices in Southlake, Mr. Coffin advises and represents business owners and individuals throughout Texas. Call toll free 800-627-5716 to arrange a free consultation.